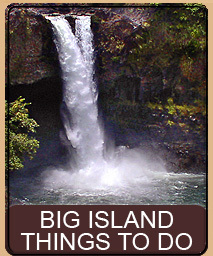 What is that delicious smell we find as we drive through the Kona side of the big island? That smell could only be one thing, the roasting and brewing of Kona Coffee, grown locally on the slopes of Mauna Kea, Mauna Loa, and Hualalai. Coffee plants are an unusual looking plant, and you will see many of them as you drive the highway between Kona and South Point. 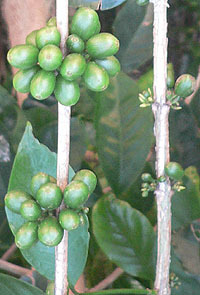 However, most people have never seen a coffee plant and thus don't know really what they are looking at. The plants stand anywhere from about 4 feet tall to 8 feet tall and have many branches with very dark leaves that tend to hang downwards giving the plant a sick, vaguely diseased look. In between the leaves, along the branches grow the bright red cherry beans that eventually make their way into your morning cup of brew. Coffee plants were first imported to Oah'u around 1813 by the Spanish physician, interpreter and advisor to King Kamehameha, Don Francisco de Paula y Marin. Interestingly, we can also credit Don Francisco de Paula y Marin for introducing another spectacular plant to the islands, the pineapple. Unlike the pineapple, which instantly became a success, the original coffee plantings did not take hold and were completely unsuccessful. 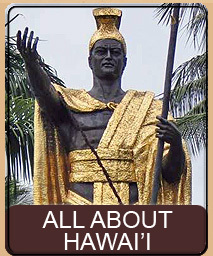 The next attempt at bringing coffee into Hawai'i occurred in 1825 when King Kamehameha II and his Queen died from measles while on a visit to England. While shipping the bodies back to Hawai'i aboard the H.M.S. Blonde, the accompanying Governor Boki stopped in Rio de Janeiro and purchased coffee plants. 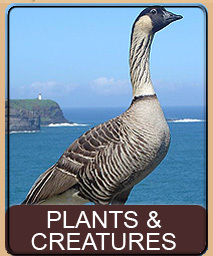 Returning to Hawai'i the plants were successfully introduced by John Wilkinson (of Captain Cook fame). 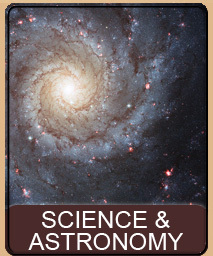 However, at that time coffee was prized mostly as an ornamental plant, and not as a favored beverage. As coffee found its way into more and more gardens and landscapes on Oah'u, the missionary Samuel Ruggles brought the first plants to the Big Island sometime between 1828 and 1829. 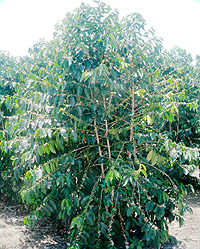 These cuttings from the original arabica trees were planted successfully but were still used primarily as ornamentals. Within 10 years, however, coffee became more popular as a beverage and shortly after 1840 the first coffee exports from Hawai'i to California took place. By 1870 over 208 tons of coffee had been exported from Hawai'i. However, in 1900 the tariff on sugar cane exported from Hawai'i to the US was removed. This caused a huge boon in the sugar cane industry on the island and much land, including quite a bit that was originally coffee plantations, was cleared and turned into sugar cane fields. 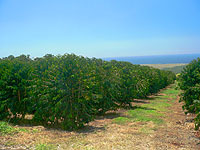 The sugar cane industry did away with the large many-acre coffee plantations but small coffee farms continued to produce Kona Coffee, though the depression and other factors affected the ability to market it successfully. As coffee emerged from just a beverage into a more gourmet status, people yearned for exotic brews grown under the best of conditions. 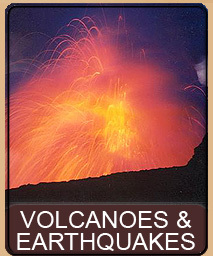 The Big Island offered some of the world's most perfect conditions in terms of soil, altitude, moisture, and sun. This caused the Kona Coffee industry to become noticed and allowed them to begin exporting successfully. Unfortunately, in 1995 the US Customs indicted a Big Island grower of selling counterfeit Kona Coffee (they claimed the coffee was 100% Kona beans when in fact it was not). This caused a huge reaction among buyers around the world with many of the refusing to purchase coffee from Hawai'i. In order to save the coffee industry in Hawai'i local companies and individuals banded together to create an organization to help market and control the quality of Hawai'i coffee. Additionally, and most importantly, the State of Hawai'i Department of Agriculture started officially certifying and grading all Hawaiian coffees, restoring faith in buyers. Today Hawai'i is the only state in the US that grows coffee commercially and exports over 100 tons per year at an estimated value of $6 million. Over 600 small (5-acre on average) coffee farms work together to produce the export with more being added every year. Indeed, you can find coffee growing in more places than just Kona, including the Puna district and Hilo district - though the majority is grown on the Kona coast between 800 and 2000 ft above sea level. However, to be sold with the name Kona attached, the coffee must be grown between Holualoa and Kealea (or there abouts). 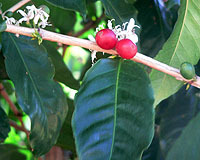 The coffee plant has small white flowers that grow out from various places on the limbs. A mature plant may have flowers and beans simultaneously, though most plants do follow a season. The 'beans' start green but soon mature into a bright red, round fruit called a 'cherry'. It takes 250 to 400 cherries to make a pound (prior to drying and roasting) and once roasted, a pound of cherries converts to 1/7 pound of dark roast. Because the farms are small, almost always family owned, they band together to have their cherries processed at a variety of local processing plants. The processing plants pulp the cherries and then dry them under the bright Kona sun. From there, the resulting 'green beans' are roasted - converting 25 pounds of green beans into 20 pounds of beautiful and delicious Kona Coffee. The picking and processing season for coffee is between September and February. Kona coffee is almost always picked by hand - due mainly to the steep hillsides that the coffee is grown on. Good pickers can harvest between 200 to 300 pounds per day. 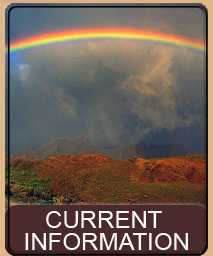 Most prized of all the Kona Coffee is the Kona Peaberry. 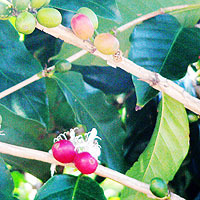 The Peaberry is smaller than the normal cherry and very dense. Only about 4% of the total Kona Coffee yield is Peaberry grade - but is highly prized for its flavor. This page is named 'Plants.coffee'. Can't Find It?